Skunks are common across the U.S. and are unmistakable in both appearance and smell. They rarely cause significant damage and are considered to be beneficial in their consumption of insect and rodent pest. Sin their noxious defensive odor that is difficult to tolerate or eliminate, few people want them anywhere near their homes, families, or pets. The following is a three-part series providing an overview of skunks, how to prevent or control skunks, and how to get rid of skunk smell if you or your pet end up in the line of a skunk's spray. The Striped Skunk is the most common skunk of North America. It has a very distinctive look with a wide, single white stripe or two thinner white stripes running the length of its all-black body, then extending on down to its tail tip. This skunk can be as large as a small house cat in size. The Spotted skunk is also found in some parts of the U.S., although they are usually only about half the size of striped skunks. Skunks are in the weasel family, related to river otters, badgers, mink and, of course, weasels. Baby skunks are called kittens. Like many wildlife, skunks are nocturnal, being most active from sunset to just after sunrise, and rarely travel more than a mile or two from their dens. During breeding season, the males will be active during the day and travel up to five miles in search of females. They prefer to eat insects, but will also eat small and/or dead mammals, such as mice, and some plants. Skunks can also be a nuisance on farms where they will attack and feed on poultry and eggs of ground-nesting birds. Despite their odorous spray, skunks are generally beneficial to the environment and humans, eating insect and rodent pests. Skunks can carry and transmit rabies giving further reason for both people and pets to keep their distance. 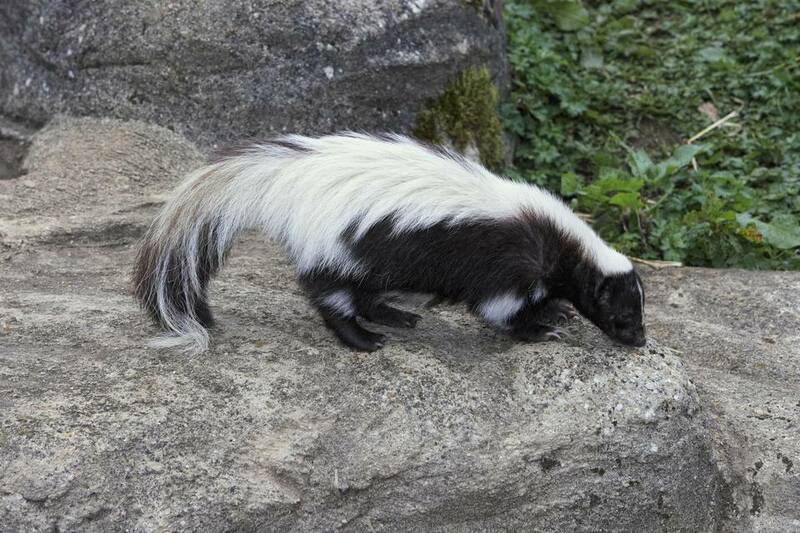 The noxious odor sprayed by skunks is a self-defense mechanism. They can spray as young as eight days old, although they do not yet have good aim primarily because their eyes don't open until they are into their fourth week of age. The skunk's spray is oil that clings to surfaces, which is why the smell can be so difficult to eliminate. Skunks do give you a warning before they spray; if you see a skunk stomping its front feet, get ready to run because it is getting ready to turn around and spray! It may also growl or hiss to warn you to get away, but once it raises its tail, your only safe if you are more than 20 feet away. The skunk can direct its spray quite accurately up to 10 feet, but the spray can go as far as 20 feet. Skunk kittens can spray when they are only eight days old. In Michigan, skunks are one of the species of small game that may be taken year-round with any valid hunting license except within state park and recreation areas from April 1 to September 14. No license is required for a resident, resident's spouse or resident's children to hunt small game on the enclosed farmlands where they live. Other small game that fall under this rule, subject to all applicable hunting laws and regulations are opossums, porcupines, red squirrels, thirteen-lined ground squirrels, woodchucks, and weasels. In Missouri, they are considered fur-bearing animals and are protected except during hunting and trapping season. If you do capture or kill a skunk in Missouri, you must contact your local conservation agent after capturing or killing a skunk so as not to be in conflict with the Wildlife Code. Idaho law allows people to trap or remove any wildlife to protect private property and personal safety, but just like the plumbing, sometimes it is better to get help from a professional. But native wildlife classified as predatory or unprotected wildlife, including skunks and raccoons, may not be released without written permission from the landowner at the release site, and you must have the written permission in your possession while transporting them. The owning of a skunk is also subject to state regulation. Although skunks have been "de-odorized" and kept as pets by some people, in many states it is illegal to own a skunk for any reason, and the state has the right to kill the skunk if it is found out. To determine the laws of your state, visit the U.S. Fish and Wildlife Service listing of state agencies that manage fish and wildlife resources.